This being my first Forrest blade I wanted to see if they lived up to the hype. I did some research and decided I wanted to go with a thin kerf basically because I was going to be cutting allot of hard maple and my Bosch table saw isn’t the most powerful, and I wanted to try and save material. I decided on this blade and the Forrest website recommended a stiffener. 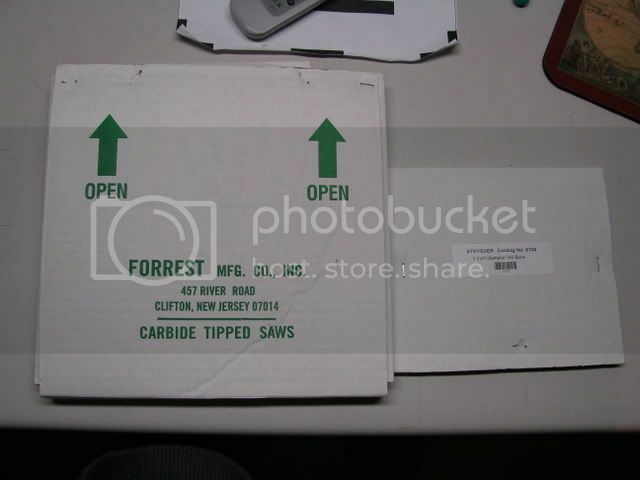 I shopped around and found a great deal on Forrestsawbladesonline.com I got the 10”, 5/8” arbor blade and the 5” stiffener shipped to my house for $107.00. Thats cheaper than just the blade from anywhere else. They shipped from upstate New York and was on my doorstep in two days. When I broke them out of the shipping container I was a little disappointed to not see the signature green blade packaging. I guess they buy bulk so they are not “retail” packaged, but actually the packaging that was on the blade was thick cardboard and protected the blade well so I kept it to use to ship back to Forrest for sharpening. The new blade sailed nicely through the hard maple. I was getting quality, almost glass smooth cut faces with little or no saw marks. When I stacked my pieces together I had perfect glue up edges without having to joint or rout or sand. The blade performed even better when I moved on to the walnut. It cut that effortlessly, again with smooth perfect faces, no burning. The saw still worked a little hard when I was pushing the maple through but the quality of the cut was light years better than the cheaper freshly sharpened blade. Overall, (and no surprise to anyone who owns one of these blades) I gave this blade 5 stars. It cut superbly and worth every penny of it’s price. Glad you are happy nice blade. We use them at the toy making workshop. I have 2 and think they are great. They cut like going through butter don’t they? Nice review. Thanx for the review, maybe you can shed some more light on the matter for me : I was considering the Forrest thin kerf, but I am using the Bosch 4100 table saw and it has the riving knife, and from what I’ve read before the riving knife is thicker then the Forrest thin kerf making it stop the wood from passing through… are you using the Bosch 4100 or 4000 table saw? have you experienced any issues like that with this saw? thanks for the review! these look like some great blades. the good reviews just keep stacking up! You guys are sure teaching me a whole bunch. Better for me to watch you pros do your magic on wood. Very nice info on the blade. When I bought my General TS I also bought a Forrest WWII; I have yet to be disappointed. Also, if you ship it to them for sharpening they also re-balance the blade and repair chipped or broken teeth. I think it proves their faith in the product the sell. Had one for 20 years, best buy I ever made. Thanks for the review Brad. Could someone who owns this blade use a caliper to provide the kerf size and plate size for the WWII thin kerf blade? I’m looking on getting one for my Steel City hybrid saw but the smallest riving knife they provide is 0.098in. Most sites seem to indicate the WWII thin kerf is 3/32” => 0.09375in which is too small to use my stock riving knife. However other places I’ve seen say its 0.100 (http://www.woodmagazine.com/wood/pdf/WOOD-Saw-Blades-II-The-Retest.pdf). I just measured 10 of the teeth around my 40 tooth thin kerf WWII. Most of the teeth at the widest point came in at 0.0995, one came in at 0.0990, one at 0.100, and two at 0.1005. On this very small sample I got a worst case spread of 1.5 mils with the majority coming in at 99.5 mils. I wasn’t being super careful and there could have been minor gunk on some of the teeth. So expect some variation for measurement technique and some for surface contaminates.